Vigo innovative product designs are a winning combination of years of research, latest technology features and unparalleled craftsmanship with a tight rein on quality control and superior service levels. So each piece you set your eyes on more than just ‘does the job’; it goes above and beyond, in keeping with Vigo philosophy – beauty with a purpose. Vigo broad range of quality products includes the latest in Bathroom Vanity and accessories like sinks and fixtures. And to help you furnish your bathrooms from start of finish, Vigo products are available either stand-alone or as a part of a matching bath set which you can put together based on your specific requirements. Vigo also specialize in designer single and double undermount kitchen sinks made of 100% stainless steel which are both practical in use and easy to maintain. 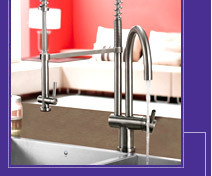 To complete the look, Vigo also design matching kitchen sink accessories for your kitchen.